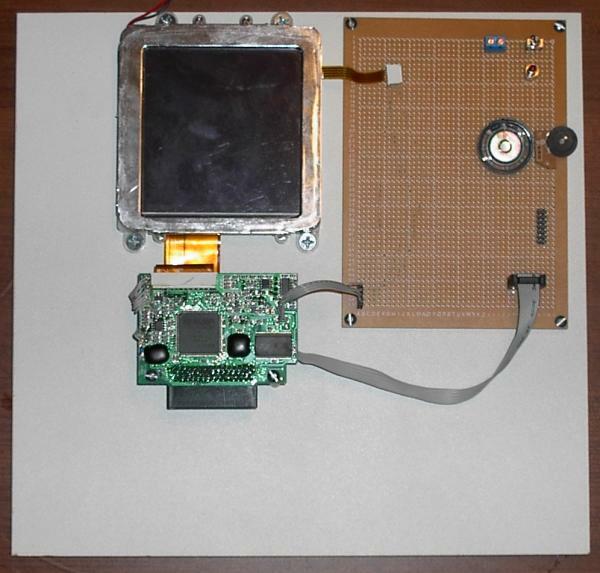 This is a Pixter taken apart and placed on a board for development. Currently this includes just the basics of touchscreen interface, power, calibrate button(GPIO), audio (PWM), and JTAG. On the todolist will be a duplication of the i/o pins (using a Pixter Dev Cart) available on the Pixter Expansion Slot which will give rise to the addition of items such as mmc interface, 10baseT nic, and rs-232 interfaces. the opposite side of the main pixter board has a pair of solder pads which appear to be for a 0 ohm resistor. the pads have a pcb trace between the pads. this pad pair is stenciled "NCS0", which is the chip select for the onboard ROM. by cutting the trace between the pads the onboard ROM can be disabled. might be possible to find an unused or duplicate pin on the Pixter Expansion Slot that can be replaced with the NCS0 line. as well as one single pair marked "option"